Before I tell you all about Intolerances Test Kit from SelfDiagnostics UK and share with you a discount code for 20% off, let me tell you about my struggles first. I’ve been struggling with my digestion for a while now. I’ve been experiencing bloating, uncomfortable stomach and other symptoms which I am just too embarrassed to mention. I was even suffering from stomach acid issues at some point which made my stomach really painful and at the same time I also felt nauseous. I went to see my doctor about my stomach discomforts several times. Unfortunately, doctors are not too much interested in discovering the root cause of a disease. For them, it’s all about treating the symptoms, so they will prescribe you one type of tablet, then another, until something finally works. We are like guinea pigs which is not great. That’s why many times you have to do your own research and pay for private tests to help you discover what’s really causing your health problems. Luckily, my doctor didn’t only prescribe me a few different types of tablets but he also referred me for a stomach ultrasound. The ultrasound didn’t really show anything unusual, I was told. I tried to treat my stomach discomforts with natural remedies but I failed. So I decided to go ahead with the GP’s prescribed tablets. I reluctantly started taking them, but I had to because my stomach was so uncomfortable and nothing natural was helping. I am now free of the painful stomach and nausea which was caused by indigestion and high acid levels in my stomach (I was told). My doctor told me that the bad diet and unhealthy lifestyle can cause stomach acid issues, but this wasn’t the cause in my case. I think it’s very likely that my stomach acid issues were actually caused by stress. Nevertheless, at the moment I still have issues with bloating and suffer from other symptoms so my stomach is still not quite right. My doctor did ask me though whether I was keeping a food diary to help me identify any foods which may be causing me issues. And yes, I did keep a food diary for a while but it was really hard to make any connections between the food and the symptoms as my stomach was feeling uncomfortable very often and bloating was just a normal thing for me. What about if there is some kind of food which gives me issues and I should avoid it? Could I have a food intolerance or allergy which I am not aware of? Possibly. It’s not something to exclude. 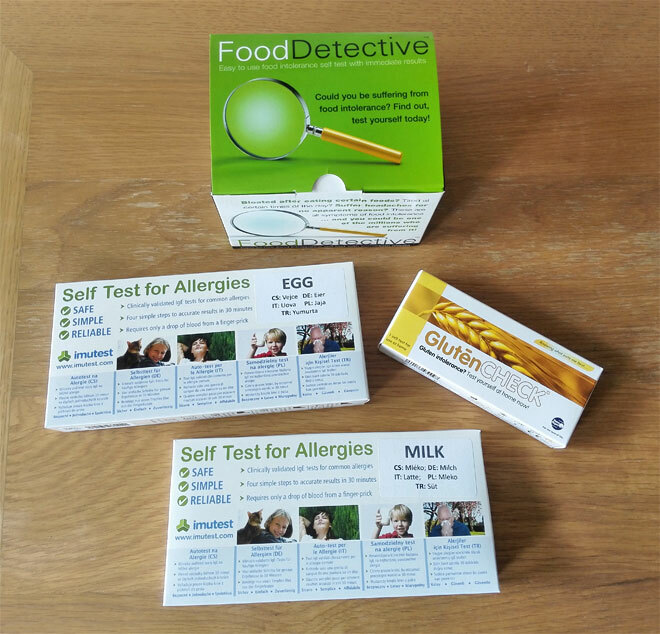 So when I was contacted by SelfDiagnostics UK, who sell home tests for different types of food intolerance and allergies, I agreed to test their products and review them on my blog. Apart from the allergy and food intolerance tests, SelfDiagnostics UK also sell other medical tests which include cancer, sexual health, family planning and menopause (to get 20% off their tests, just click here to scroll down to the discount code). This package does contain lots of various tests which may be all a little bit overwhelming to look at, even for me who’s done the home tests before. But as long as you read and study all the instructions carefully, you will be fine. Just make sure you fully understand everything that you need to do before you go and attempt any kind of test. I would recommend you read the instructions twice, just to make sure you perform the test correctly. The GlutenCHECK test is intended as an aid in the diagnosis of gluten intolerance. It’s suitable for both, an initial diagnosis of gluten intolerance as well as a therapy follow-up. To test yourself at home you need to draw some blood from your finger first. Next, mix your blood sample with a special solution which you then drop onto the test cassette. You will get your results after 10 minutes which is the biggest advantage of taking this home test. This is a much better option than the one when you have to send off your blood sample to a laboratory and then wait for a week for the results to arrive. In terms of the contents and instructions, you get everything that you need. Instructions are easy to follow and the test is easy to perform. The only issue I had was a lancet. I am not a newbie when it comes to using lancets but this one was different to the lancets I used in the past. I twisted the grey cap on the lancet, as instructed, and then twisted it again but then when trying to prick my finger with it, it just wouldn’t work. I don’t know what happened, but maybe I did something wrong. Luckily, I had a spare lancet at home which I then used. Normally, these home tests come with two lancets, just in case one is not enough, but not this test. Maybe this is something they will change in the future. But not to worry, if your lancet doesn’t work, SelfDiagnostics UK will happily send you more if needed. However, it’s good to know that you will find lots of lancets within the Intolerances Test Kit and once you prick your finger you could use the blood from the same finger for two different tests (but you have to be fast as the blood dries pretty quickly). Apart from the lancet issue, I found this test great. If you wondered about my results, they came out negative, so no, I am not intolerant to gluten. The test is 98% accurate and if you do find it positive it’s recommended to go and see your physician who will confirm your diagnosis and give you recommendations on gluten-free diet. Milk is not something I would expect to be allergic of since I had tonnes of milk when I was a child and from what I can remember it didn’t cause me any issues. But you never know, allergies can develop in the adulthood as well. I was a little bit disappointed not to see an alcohol wipe and a plaster in this test kit. But not a problem, I had plenty of plasters at home so I got myself one ready before doing the test. When it comes to an alcohol wipe, I guess this is not all that important (otherwise it would have been included). You just have to make sure you wash your hands well and dry them with a clean towel before you start. Before performing the test I spent some time studying instructions, making sure I understand exactly what I need to do. My advice to you: You don’t want to start pricking your finger and then reading what you need to do next, you have to act fast when the blood starts coming out of your finger so do read all the instructions first! I had no problems following the instructions and had successfully completed the test. The test can be used at any time of the year. You do not need to be having an allergic reaction at the time of testing. It is not necessary to stop any medication before using this product. I was a little bit surprised by the results. I had a pink line opposite the triangle symbol which meant the test worked correctly. But I also had a faint pink line opposite the square symbol which translates into a positive result. This means I have high levels of IgE allergy antibodies in my blood and I am probably allergic to milk. The next step for me would be to seek some medical advice to confirm this is indeed what I am allergic to. Imutest results have been proven to compare well to laboratory tests, but no single method to diagnose allergy is completely accurate. The test for egg allergy is made by the same company so the process is exactly the same as above. The blue and white lancets work very well and never had any problems with them, also when I used them for home tests in the past. My results for an egg allergy came out negative. The line which indicates that the test worked correctly was more visible in this test comparing to the previous one. I think that’s because in the previous test I put a little bit too much blood onto the test cassette. So yes, the amount of blood you use will affect your test results so make sure you don’t go over the line! Food intolerance is associated with a wide range of unpleasant symptoms and many chronic conditions. Unlike food allergies, food intolerance is unlikely to be life threatening. Food Detective Test comes with lots of different bottles containing different solutions which seems a little bit daunting at first but when you watch the video online, you will feel much better about it. It’s not difficult to use at all, the more challenging part of the test is obtaining enough blood. Please note that this test will reveal the foods you are intolerant to. This is not the test for allergies, it’s a different type of test which works differently (it detects IgG antibodies as opposed to Imutest tests which detect IgE antibodies). To learn about the difference between a food allergy and food intolerance check this article. It’s a good thing this test comes with two lancets. I had to use them both in order to obtain enough blood for the test. When handling the bottles with various solutions be extra careful, you don’t want to knock one of the bottles by accident! I am saying this because it happened to me and it was the main solution with a blood sample in it, unfortunately. I only lost about a teaspoon of that liquid though which I don’t think it affected the results. But it may have. Any circle with a strong blue colour indicates a strong reaction to that particular substance. The recommendation is to eliminate these foods from the diet for 3 months and then slowly re-introduce them while monitoring any symptoms. My results showed a strong reaction to milk which just confirmed the allergy test above, but then I also had a strong reaction to eggs and cashews. I was gutted! Eggs play an important part in my mostly vegetarian diet and I cannot think of what I would replace them with if I had to stop eating them. But in one way I am not surprised by this result as eggs do give me issues, I would always feel bloated after eating them. So although I am not allergic to eggs (which the egg allergy test above showed), I do have an intolerance which I am really not happy about! I was really surprised by my reaction to cashews. I love these nuts and eat them almost every day! And I also had a moderate reaction to almonds, but only a mild reaction to brazil nuts and peanuts. It seems that nuts don’t sit with me very well! Interesting results which I am definitely going to take action on but it’s going to be a challenge. 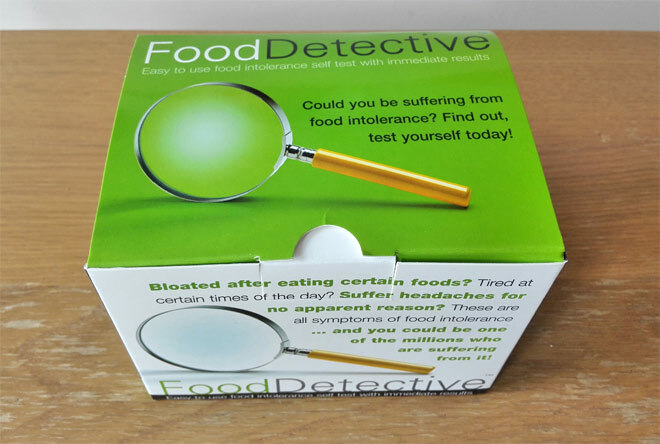 The Food Detective Test comes with a dietary support guide which explains everything about food intolerance and what to do with the information obtained from your Food Detective Test. This is a really useful guide which also tells you about alternatives to the food you had a reaction to. If you are suffering from various digestive issues and are struggling to identify the cause, then the home tests for food allergies or intolerances are one way to go. It could be that your IBS is not even IBS, it could be a food intolerance! 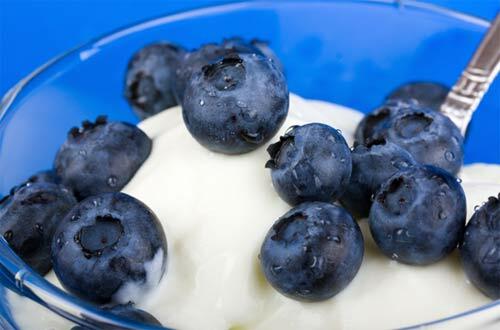 In many cases, food intolerances are mistaken for other digestive disorders. In the UK up to 2% adults suffer from a food allergy but food intolerances are much more common with up to 45% of the population suffering from some form of food intolerance. The symptoms associated with a food intolerance are not only gut-related – food intolerances have also been linked to migraines, chronic fatigue, eczema, skin conditions and joint paints. So you never know, your health issues could be caused by a food intolerance and if you are suspecting this it’s important to get tested. I found home tests from SelfDiagnostics UK easy enough to use with instructions which were easy to follow. Just to keep in mind that in order to get accurate results you do need to perform these tests correctly and ideally you will have somebody to help you. You should spend plenty of time reading the instructions and follow them religiously. Only like that, the test will be a success. What I really like about these tests is that you get your results really quickly, you don’t have to wait for a week! And now the best part! If you would like to buy Intolerances Test Kit for yourself or somebody else you don’t have to pay a full price, just use the code PETRA20 to get 20% off! This code will also give you a discount on other products on the website. Do you think you may have food allergies or intolerances and have you ever considered taking tests at home to help you get to the bottom of your issues? Excellent article, thanks for sharing your experiences! Thanks so much for sharing this. It sounds very very similar to what I went through with IBS symptoms and not being able to pin down or see a correlation with what I was eating and what was triggering it. I too took a blood test which showed a yeast intolerance and I cut out a lot of things which I found massively helped my IBS. HOWEVER the more I read and heard about blood tests the more I found the science is rather unreliable. The only truly reliable way to find out what you’re intolerant to is by elimination (at the moment anyway). That being said, and as the title of my blog post states, I am still so pleased I did the blood test. Because it’s made me much more aware of what I eat and exciting new ingredients and foods to try which make me feel better. And ultimately that’s what I wanted. Whether the science is ‘right’ or ‘wrong’, the result was better gut health for me. Lovely to share experiences and try to get to the bottom (no pun intended!) of the complicated world of the gut. Hi Vicky, it’s good to know about your experience and yes, I am aware that these tests may not be 100% accurate. It’s really good to see that you are now much more healthier after after cutting out certain things out of your diet following your test. My test also showed a moderate reaction to yeast but I think I will start first by avoiding eggs and see whether that improves my symptoms. Elimination diet is definitely a way to go but at least I know where to begin! Hi Petra, this made for really interesting reading. It’s something I’ve been interested in doing myself for digestive issues and rosacea. When I investigated locally the costs were a bit too high for me, so I’m keen to look further into Self Diagnostics. I look forward to hearing if things have improved for you once you’ve eliminated eggs/milk and nuts from your diet. I think it’s definitely worth doing considering that almost half of us suffer from some kind of food intolerance. I think the prices from SelfDiagnostics are quite reasonable, especially if you take into account 20% off discount. I am definitely planning to go on an elimination diet at some point in the near future and I am hoping to report on my results as well. 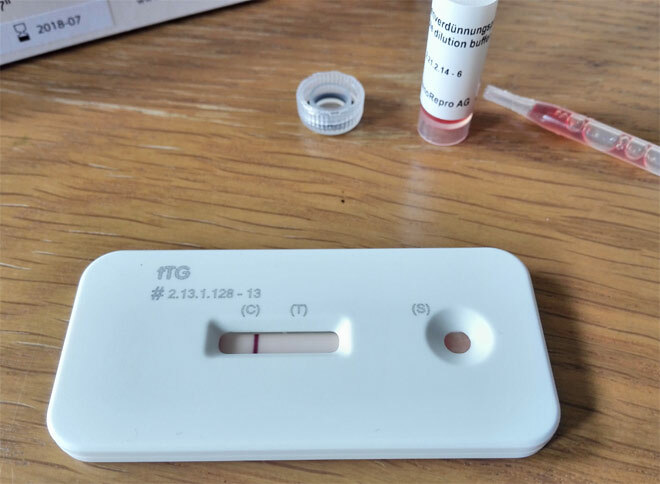 I’ve always considered doing one of these kinds of tests, but never taken the plunge – great insight into how they work and the things to look out for, especially for someone like me who’s never used a home diagnostics kit! I am glad you found the article useful Hebe! 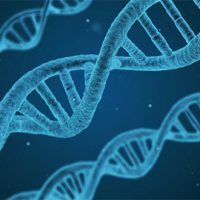 Hopefully it will help you if you do decide to buy one of these tests. Great article Petra, very detailed and interesting read. I am glad to hear that you liked it Keith. Let me know if you decide to take any of these tests and how you got on! Very interesting read…I may consider doing these tests too. These tests are good to do if you have some kind of symptoms and you are suspecting that it may be down to certain food. Health should always be a priority and with that many products are now being offered by companies and experts for people to be able to provide basic treatment for their own bodies. Yes, I agree, we should prioritise our health and luckily we have access to all kind of tests these days which makes our job easier.